It's 4 a.m. and we're dropped off at the starting point of the San Diego half-marathon. The eventual 7,500 of us are a varied mix -- from first-timers eager about their longest race yet to seasoned pros looking to beat their personal best. Me? I'm thinking "Gee, I haven't eaten since 6:30 p.m. last night -- and the race doesn't start for another three hours . . ."
You can imagine how hungry I was around 9 a.m. in the finish line area. While everyone else were hanging around the pavilion checking their times, doing cool down stretches, giving each other high-fives and picking up the usual finisher freebies, I just dashed another mile to meet up with my dining companion to head to brunch. Like the pre-race dinner joint Terra, I found Adams Avenue Grill through cursory searching of Citysearch, Chowhound and Yelp. Despite its limited breakfast menu, it got fairly good reviews -- so worth a shot. I also liked that it wasn't too close to the finisher's area (and thus won't be too packed and busy with other runners looking to recover their carbs as well). Located in the University Heights neighborhood, the restaurant has a casual neighborhood, slightly artsy ambience (the closest LA restaurant comparison I can think of is Marston's, but bigger and more humble-looking/run-down, depending on how you look at it). It didn't us long to decide on our order. 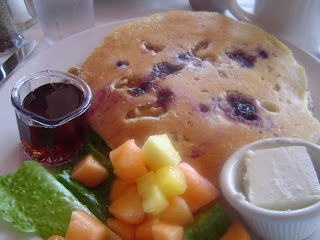 I got their special blueberry-walnut pancakes, which looked nice on the menu but was a bit of a miss when it came out. The pancakes themselves were fluffy and light, but the blueberries were unusually tart and they didn't chop up the walnuts, and it's a bit jarring to suddenly get half a nut in my mouth. I'd much rather have smaller pieces distribute throughout to get a consistent light crunch. 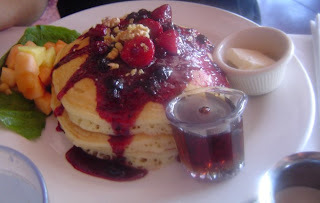 Likewise, the topping on my dining companion's triple-berry compote triple pancake stack turned out way too sour. Thankfully, the compote only soaked through the top cake so she ate mostly the bottom (which were decent, albeit ordinary, buttermilk pancakes). I tried to correct with extra maple syrup, but neither of us finished our stacks. The side of fruit is the usual pineapple-melon blend so nothing to write about. Coffee was good though. Not sure if that was just an off-day for the kitchen or if San Diego folks like everything a bit more acidic, but it wasn't a brunch that I cared for. It's not so bad I'll avoid it entirely, but I'll probably return only at the recommendation of my other friends down there. In the meantime, I'm sure there are lot more great morning eats to be found in the city. Congrats on finishing the race! You deserved a nice brunch after that. You might want to try the creme brulee french toast at Brockton Villa in La Jolla next time you're in SD. Carbo-load, buddy! You earned it.